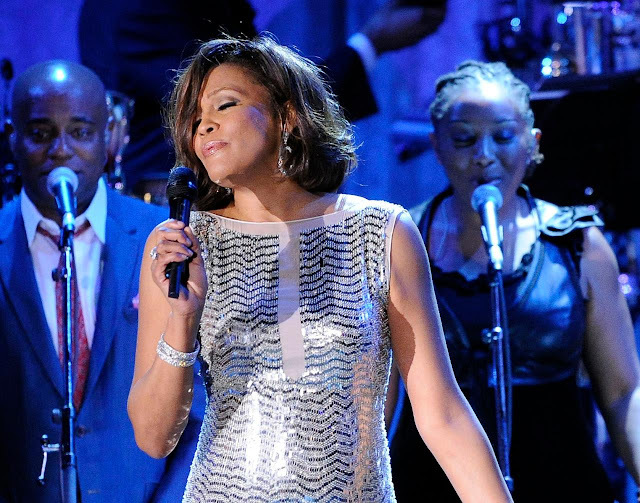 In this Feb. 13, 2011 file photo, singer Whitney Houston performs at the pre-Grammy gala & salute to industry icons with Clive Davis honoring David Geffen in Beverly Hills, Calif. Celine Dion, Jennifer Hudson and Usher will pay tribute to the late Whitney Houston in a one-hour TV special. "We Will Always Love You: A Grammy Salute to Whitney Houston" will tape Oct. 11 at the Nokia Theatre L.A. Live and will feature performances by Dion, Hudson and Usher. It will air Nov. 16 on CBS. The Recording Academy announced Thursday that the special will also include Houston's "most memorable performances" and interviews with various artists. More performers will be announced. The compilation album, "I Will Always Love You - The Best of Whitney Houston," will be released on Nov. 13.